The banner for The Blakeslee Center was unveiled on Thursday evening at the March for Meals event. POMEROY — The future home of the Meigs County Council on Aging will be known as The Blakeslee Center in honor of the late Charles Blakeslee, the agency announced this week. The name for the center was announced on Thursday evening during the annual March for Meals cake contest and auction hosted by the Council on Aging. The Council on Aging is currently working on renovations to the former Meigs Junior High/Middleport High School. Shaver went on to explain the involvement of Blakeslee in the community, before revealing the center’s name. “In 1972 there was a group of people who put their time, their skills and their talents together and started what we now know as the Meigs County Council on Aging. In that group was a very special man who not only gave countless hours to this organization for nearly 40 years, he also gave his time and talents to many organizations in Meigs County,” said Shaver. “He served on the library board, on the board of the museum and historical society. He was a 50-year member of Rotary Club and represented Meigs County at the White House Conference on Aging. He was a 50-year member of the Grange and also served as the director of the Meigs County Regional Planning Commission. He was President of the Ohio Association of Museums and Historical Societies,” said Shaver of Blakeslee. Blakeslee served as the Meigs County extension officer for many years and was devoted to the 4-H program. Blakeslee and his wife, Daisy, raised their two daughters in Meigs County. “He loved this county and the people,” said Shaver. “We chose to honor him and his legacy by naming the building after him so that his good deeds would never be forgotten. It is with great pride we announce The Blakeslee Center,” concluded Shaver. In thinking of a name for the new center, Shaver noted that simply calling it a senior center would not be reflective of what the building will encompass. “We are excited to soon open the doors to the public and show you what is available to you. We will host concerts, small conferences, business trainings, dances, banquets, parties and more,” said Shaver. No opening day has been set as work is getting ready to take place on the heating and cooling systems, as well as the plumbing. “On any given day there will be activities going on simultaneously in the building. There will be people eating in the cafe, people attending adult day care, people shooting pool, playing basketball, walking on a treadmill, lifting weights, attending spin class or boot camp. There will be an arts class and a group doing Tai Chi in our courtyard. … The possibilities are endless,” said Shaver. Discussions on finding a new location for the Senior Center had been taking place for the past 25 years, noted Shaver, leading to visits to other centers for ideas. She added that there is no reason the people of Meigs County cannot have the same things that the rest of the state has. On the wish list of items were to be back in the heart of a village, a large flat parking lot, and a yard. All of those things are available at the new location in Middleport. The Council on Aging is still accepting donations toward the work at The Blakeslee Center, with several levels of sponsorships available. For more information on the capital campaign contact the Meigs County Council on Aging at 740-992-2161. For more on the March for Meals event see page A6 of today’s edition. 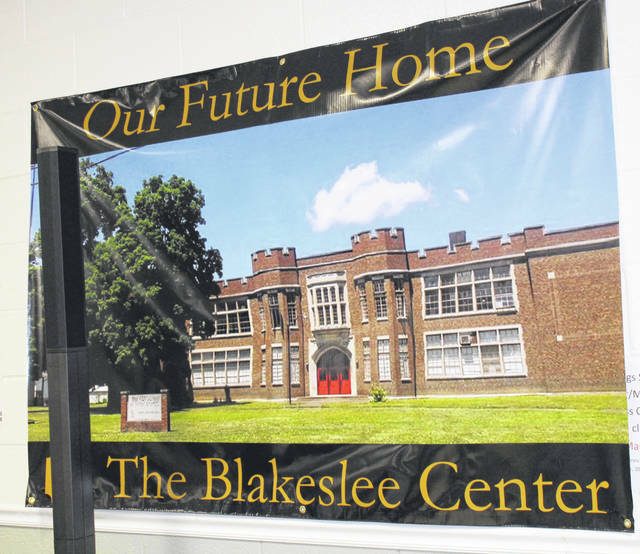 https://www.mydailysentinel.com/wp-content/uploads/sites/14/2019/03/web1_3.31-Blakeslee-Center_ne201932913355176.jpgThe banner for The Blakeslee Center was unveiled on Thursday evening at the March for Meals event.